Region, southwest of the mysterious Tibet Autonomous Region, and to the north of the oblate Mt. Everest, the highest peak in the world. Seen from here, Mt. Everest appears like a lofty pyramid surrounded by mountains that touch the sky. On sunny days, a pile of thick clouds, just like a white flag floats lightly above the peak, which is known to be the miracle of 'The Highest Flag Cloud in the World'. Nowadays, with the golden travel boom to Mt. 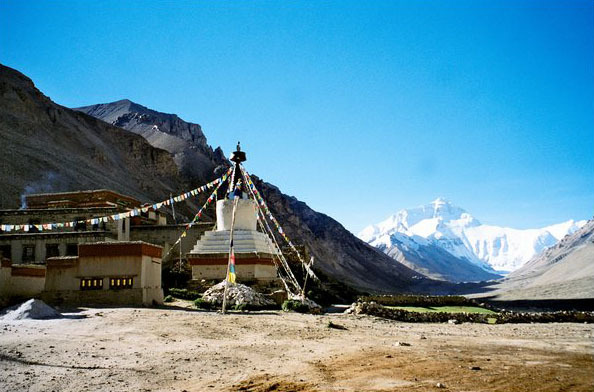 Everest, Rongbuk Monastery is gradually becoming a highlight for the tourists in its own right. and celebrate the Buddhist festivals together. From 15th April of the Tibetan Calendar the monastery will hold a Buddhist dancing ceremony, which will last for three days. This is held to celebrate the birth of Sakyamuni, which is known as Saka Dawa Festival. During the play, many monks disguise themselves as Rabbis and dance many scenes one after another, and most scenes portray different characters and clothing. The noisy and special activity often attracts many local residents and visitors to the temple. Another Tibetan festival is held on 29th December of Tibetan Calendar to placate wandering ghosts, and monks wearing masks also perform this grand ceremony. 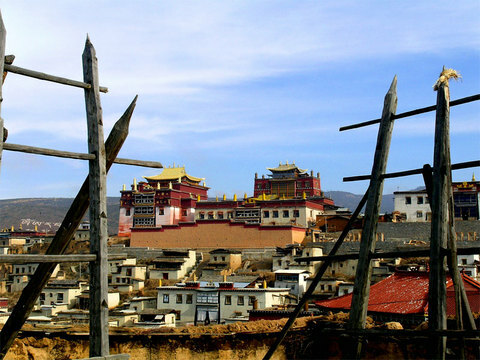 Rongbuk Monastery is connected to Shigatse City and Lhasa by a road, so it is easy to get to those two beautiful cities from this location. Besides, travelers who decide to climb the Mt. Everest can also stay here at night. It is about 8 km. (4.97 mi.) to the Everest Base Camp and a good point to appreciate the scenery there at dawn and dark. In front of the monastery are a white pagoda and a Mani Stone pile, which are often selected as the foreground to take photographs of Mt. Everest. There is a guesthouse and a few hostels around the monastery. Each room can accommodate 4 – 5 people. There is also a small restaurant opened by a Tibetan, the prices there are a bit high, but we suggest you bargain with him with some simple English. Due to the disadvantaged location, you cannot expect too much from the conditions there.